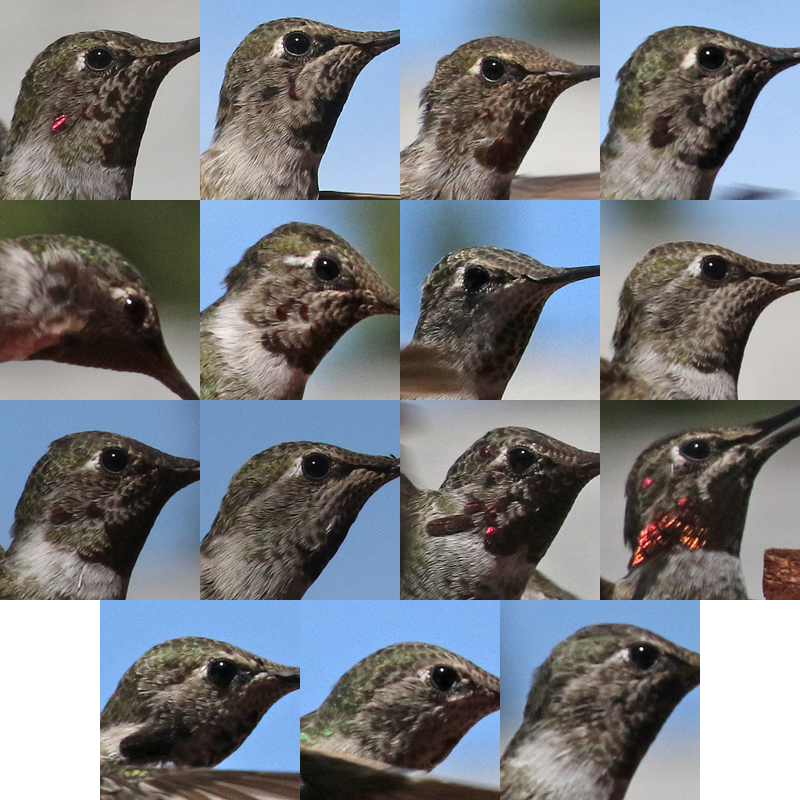 Hummingbird census July 2016 in my backyard. Photos were taken on the 19th from 1 to 4:30 PM. 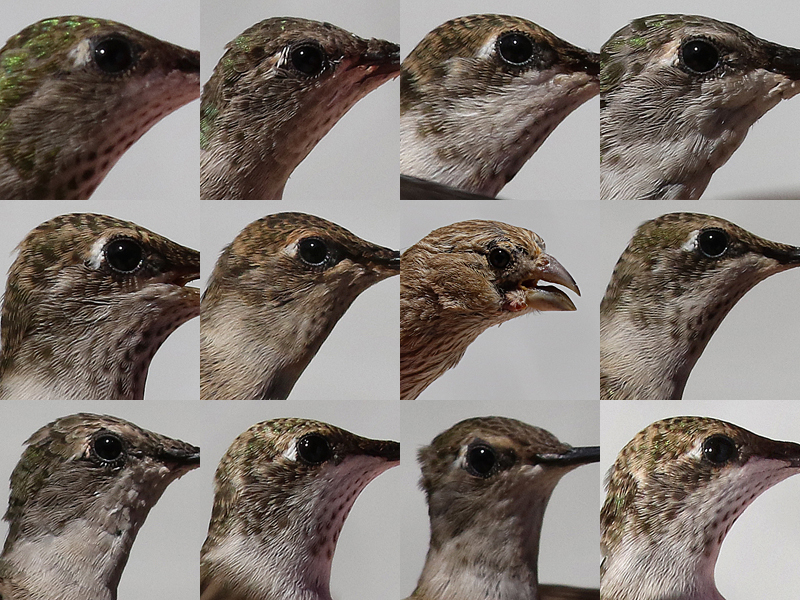 This table summarizes my findings, a total of 113 individuals visited my patio. 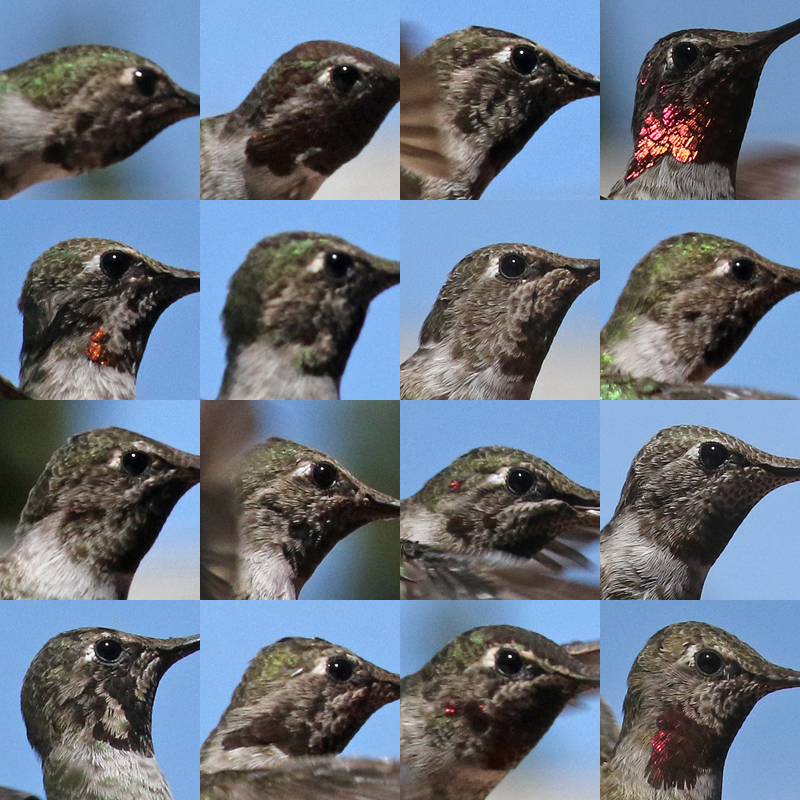 This is my third hummingbird census. With each successive shoot, the more surprised I am. 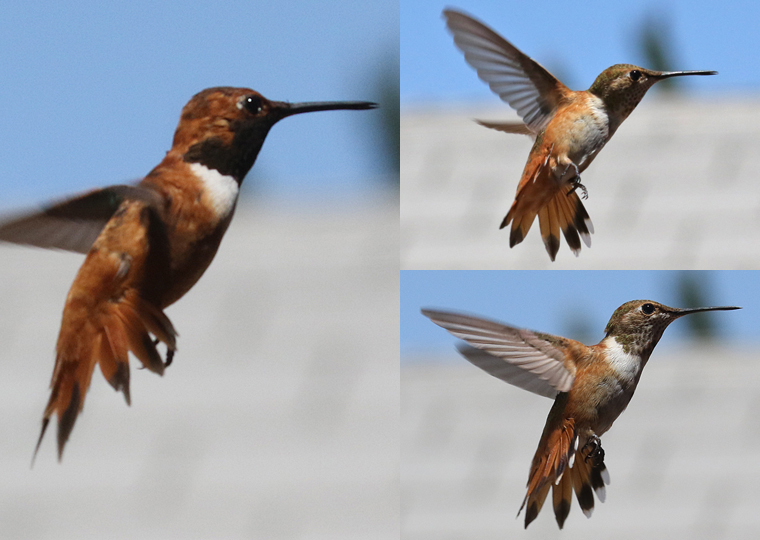 Photos are taken on two consecutive days over a four hour period each day (July 4th and 5th). 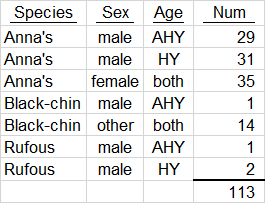 This table summarizes my findings, a total of 107 individuals visited my patio. 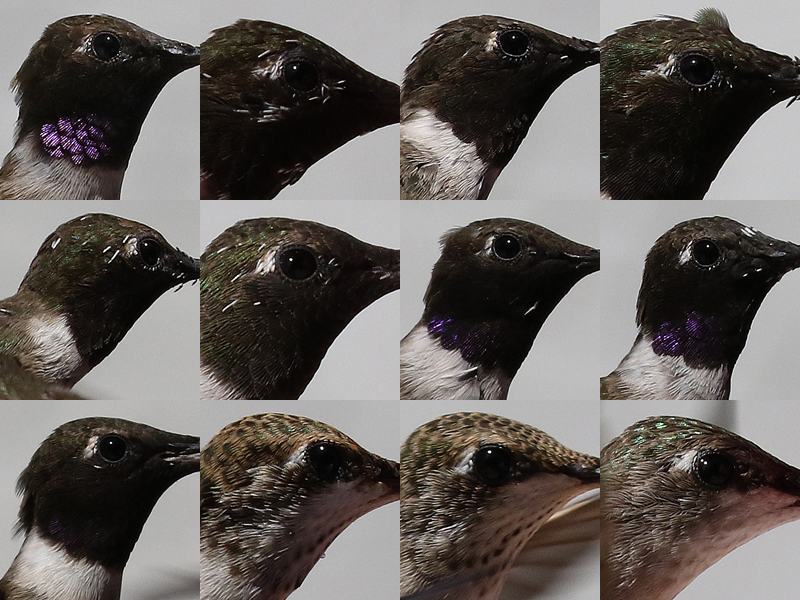 36 birds were caught in both photo shoots while the remainder were seen in only one of the sessions. 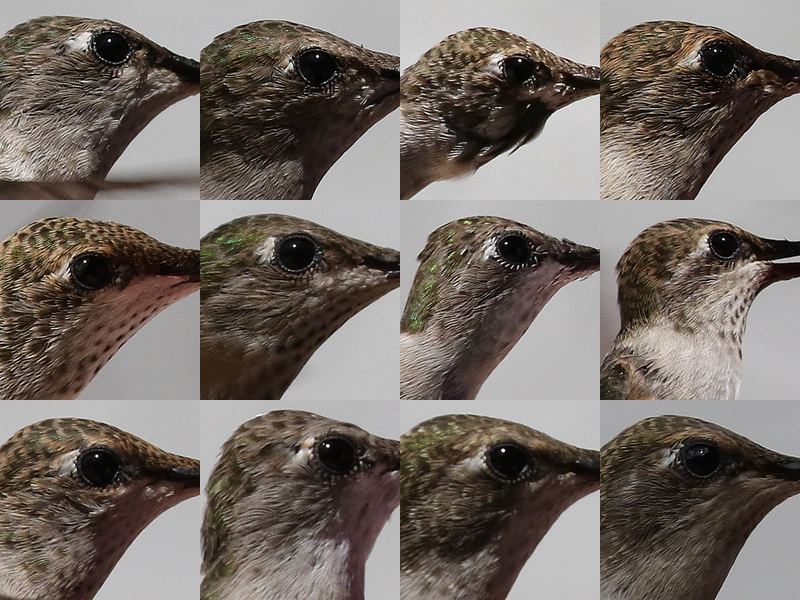 The first two composites consists of all Anna’s Hummingbirds (ANHU) after hatch year males (AHYM). I catch most individuals twice in a four hour period. 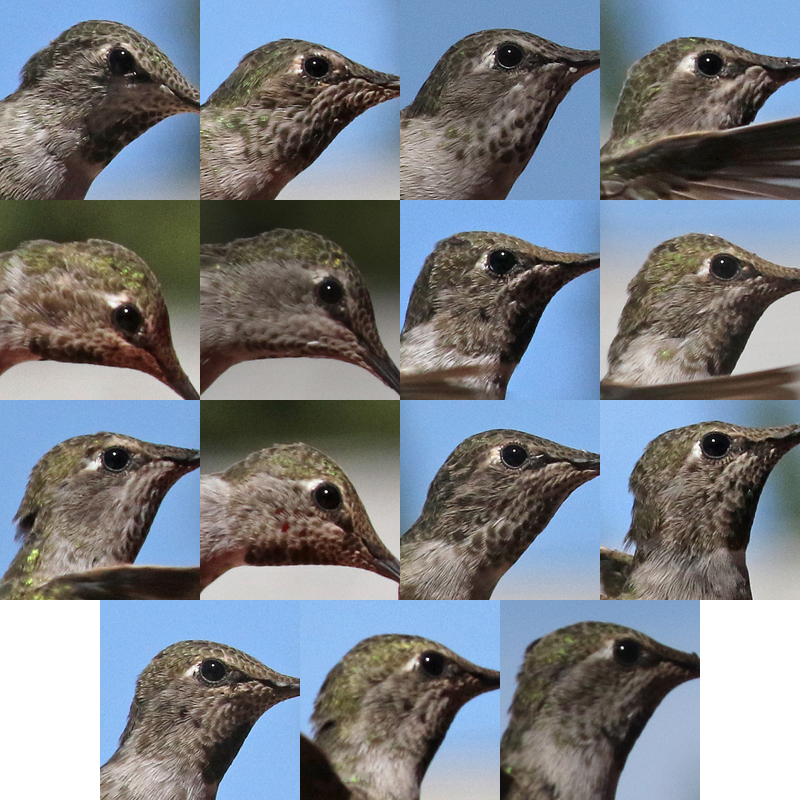 Bird #24 (bottom right of this composite) starts a new series. 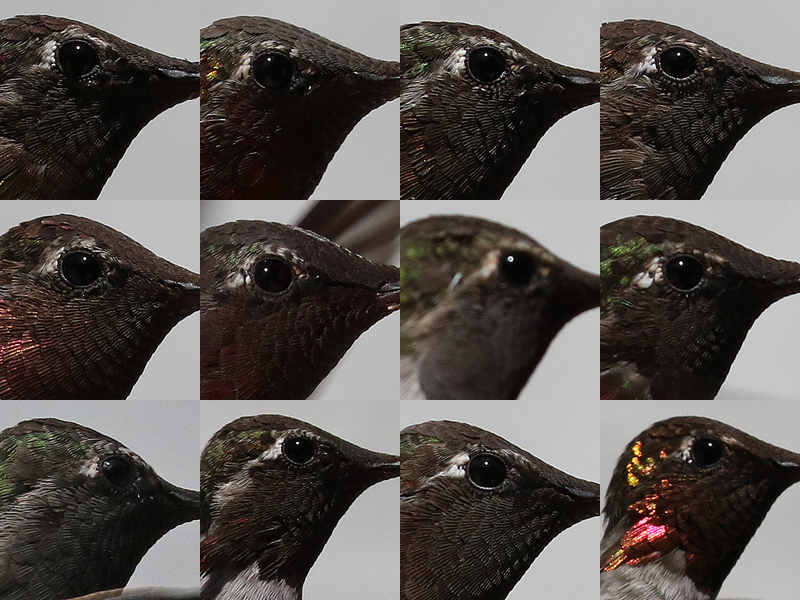 These birds are in order by time of day, notice I was getting more iridescence later in the afternoon. 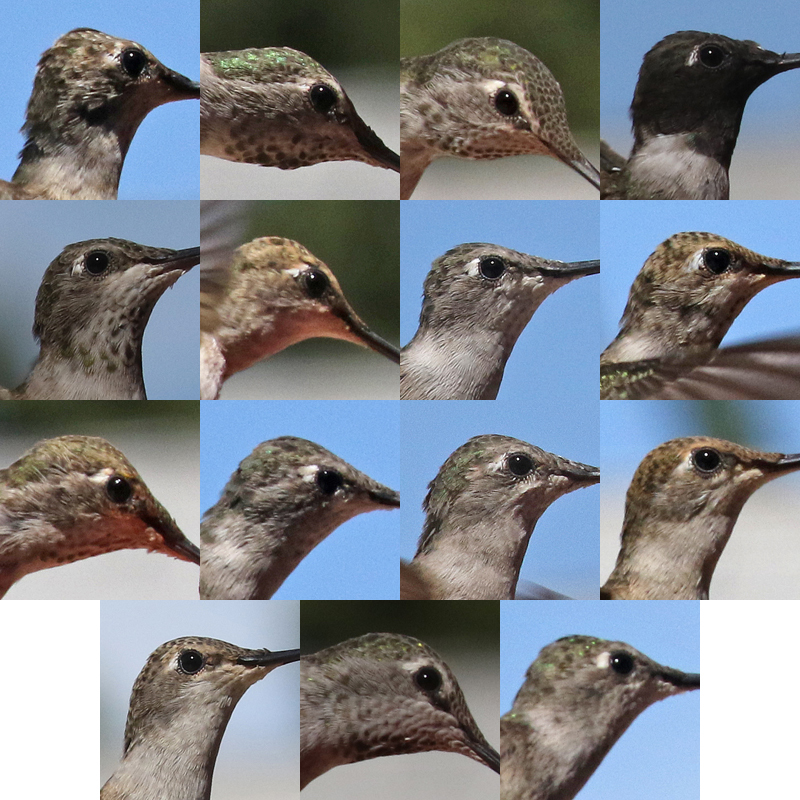 Hatch year males look very much like mom and their sister, so lumped them together. 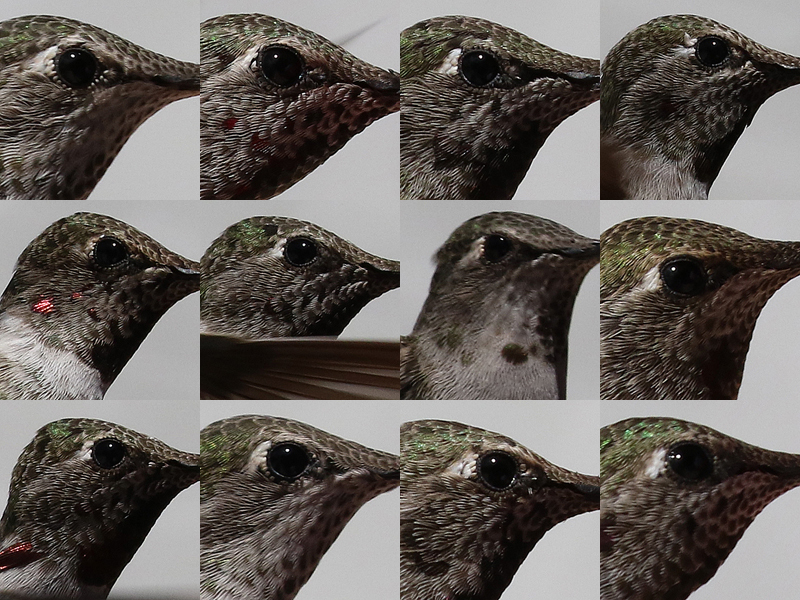 These are all Anna’s Hummingbirds, ANHU other. 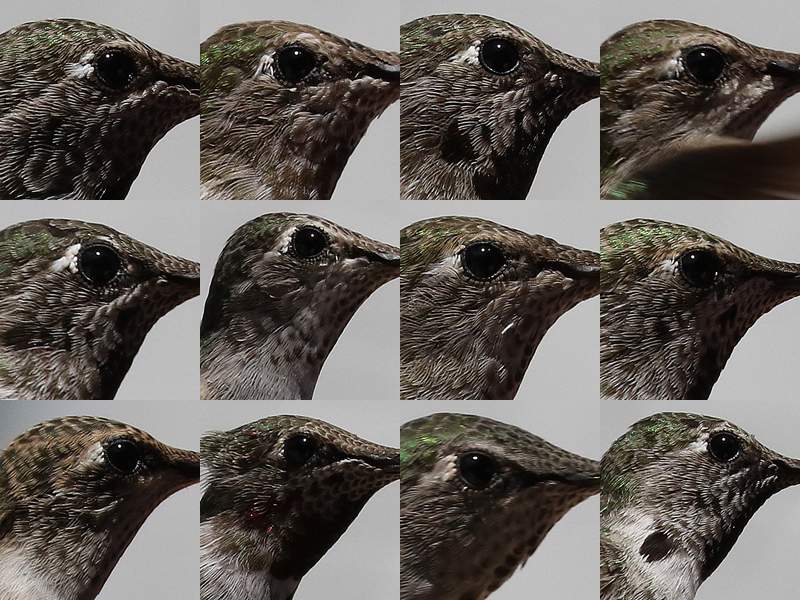 The distinguishing mark on all these birds is the post ocular spot, the white feathers behind the eye. 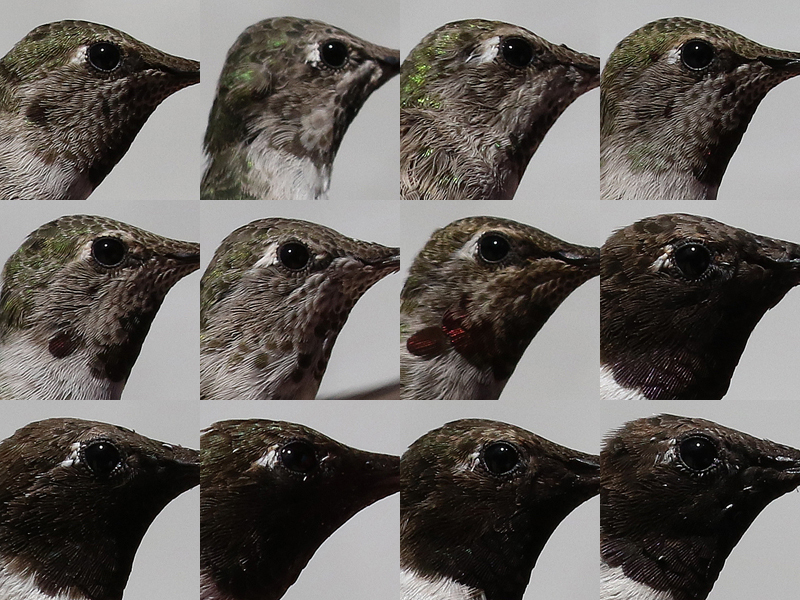 Based on the way the counts came in, I am fairly sure that many of these are migration visitors. 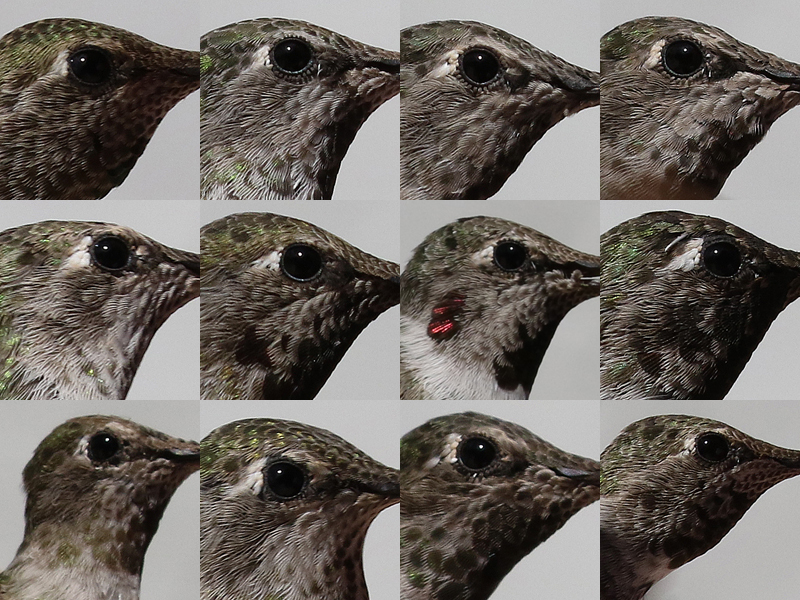 The last row of this panel starts the Black-chinned Hummingbird after hatch year males, BCHU AHYM. 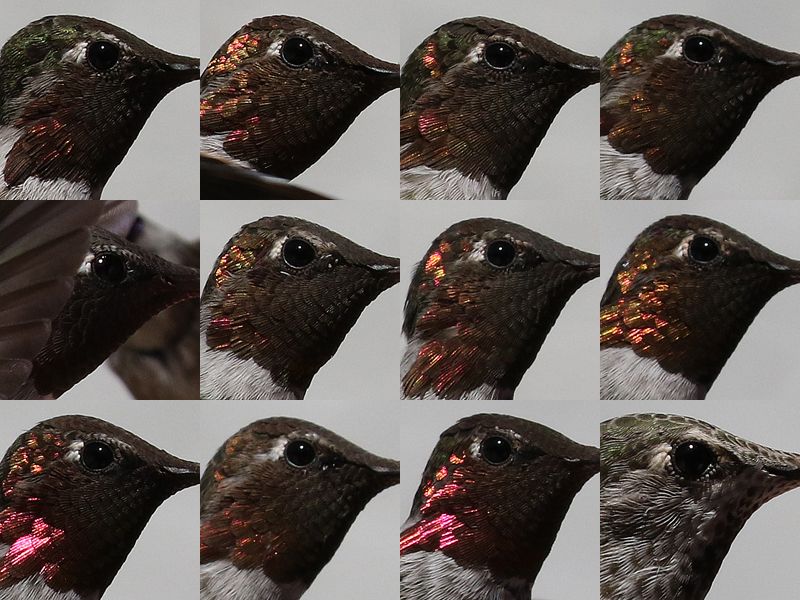 This is the first time I have caught Black-chinned in molt. The white stubble that you see are sheaths covering new feathers. 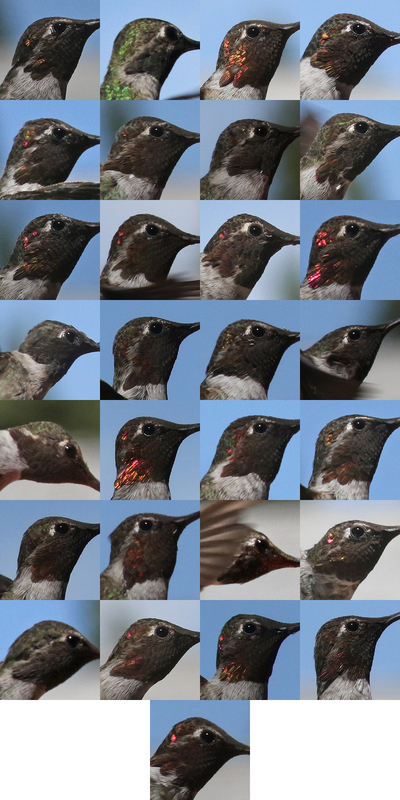 As with Anna’s, the hatch year Black-chinned males look similar to their moms and sisters. 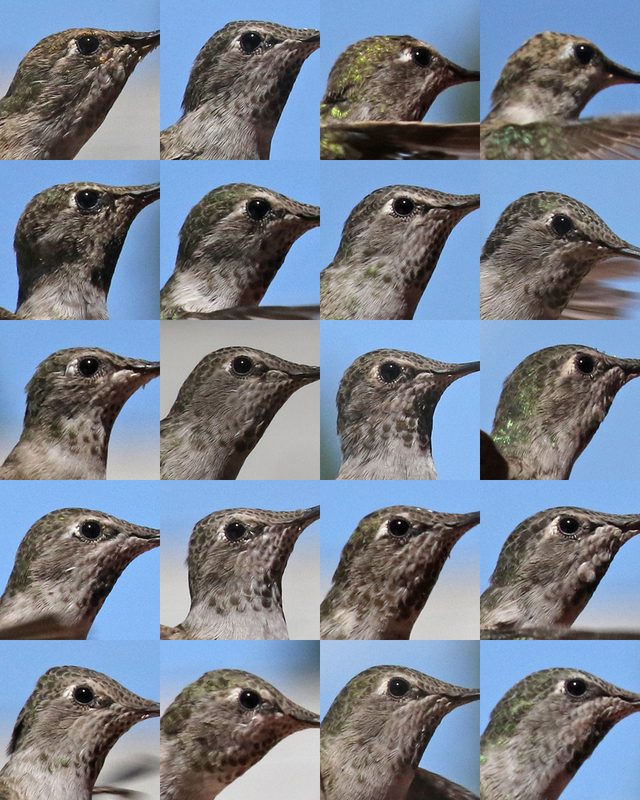 Since I only captured 107 individuals I had to fill in the blank.